Putting WHY? and Florist together for a show seems like an unlikely pairing. 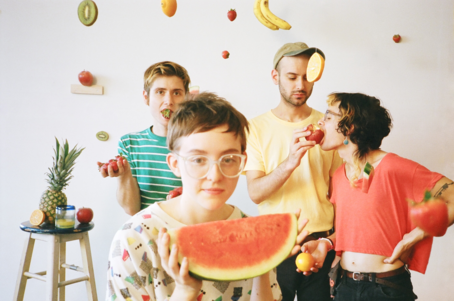 Florist are known for their slower and quiet songs with simpler melodies whereas WHY? brings a lot of upbeat songs with a lot of instrumentation. But the two together made for a balanced show that brought something for everyone. Florist opened up the show with their song “Cold Lakes Quiet Dreams.” It was just Emily Sprague and Rick Spataro on stage, each with a guitar and Rick with a small keyboard with different sounds loaded up. Between song Sprague talked about touring, the weather, and a twitter request they’d gotten for a specific song. Then it was time for WHY? to come out. There were technical difficulties with the microphone, but they got it sorted out and jumped into the music. Their set was upbeat and visually stunning. There were filament light bulbs that would light up periodically. The band admitted to being in their pajamas due to the fact that they were sick, but that didn’t stop them from providing a great performance. Throughout the set you could tell that there were lots of big WHY? fans because they would cheer at the first chord of any given song and sing along to every word. WHY? offers an interesting mix of genres that made the concert exciting. From indie rock to rap to electronic, the band was able to meld those together and provide an energetic performance that had the crowd dancing along.